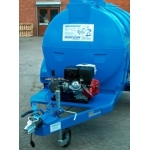 Trailer and Skid mounted pressure washers from Morclean. 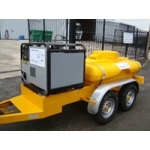 For mobile and site work our trailer mounted high pressure cleaners and jetters are ideal. Petrol and diesel driven high pressure cleaners (both hot and cold water), are mounted either to skids, trailers, or water bowsers for mobile use and remote locations. The machines are most commonly used for graffiti and gum removal purposes as well as patio cleaning, Lorry and HGV washing, fly poster removal and road sign cleaning. Hot water self contained unit with 17Hp twin cylinder electric start water cooled engine with low water cut off. 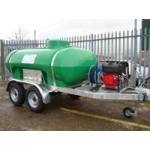 These self contained mobile machines therefore have their own water supply and can be used anywhere. Typical Specification Flow 22Lpm Pressure 200Bar Temperature 30-140 Degrees Pump 3 piston plunger pump Motor Speed 1700Rpm Optional Extras Available Tool Box Engine Cage Hose Reel Lance Holder ** Available in 500, 1100, 2000Ltr tanks For further information, please click here. 10Hp hot water pressure washer mounted on water bowser made from polypropylene. Single cylinder Lombardini engine, air cooled, pressure reducer. Typical Specification Flow 17Lpm Pressure 170Bar Temperature 140 Degrees Detergents Low pressure chemical Features Pressure regulator valve Optional Extras Available Tool Box Engine Cage Hose Reel Lance Holder ** Available in 500,1100,2000Ltr tanks, available with or without covers For further information, please click here.